Well here I am again, trying to keep up with this challenge. Actually as you can see from the title I am cheating today by doing a 2 for 1 effort. E & F Together! E is for empty and F is for full. 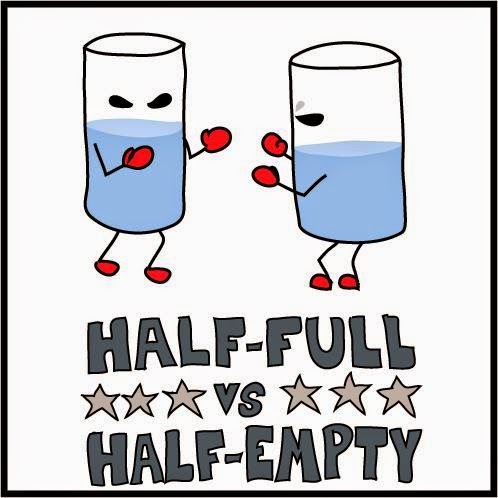 Yes, you have guessed correct, it is a reference to the glass being half empty or the glass being half full. So which are you, full or empty? I confess that I am a glass half empty kind of person although I do occasionally have smatterings of half full glasses. Of course what we are actually talking about here is pessimism versus optimism isn't it? Or is it? Now that is where it gets me all wound up. You see, although I am a half empty person, I am also a pretty optimistic person. What I definitely am is a realistic person. I am a person who deals in facts. So the fact is the glass in front of me is half empty. I can see that. Realistically, there will always be times when it is going to be half empty. BUT.... I am ever optimistic that sooner or later it will be full. So when I say that I am a "glass half empty" kind of girl, don't judge me and mark me down as a miserable pessimist. I am a realist. I am also extremely grateful that I have a glass. 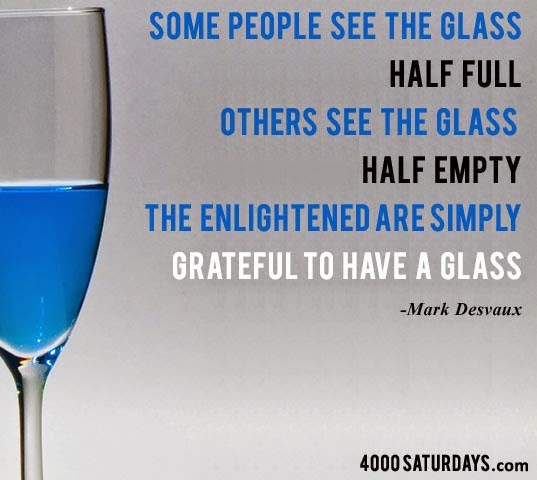 Always be grateful for your glass, whatever the content. Your glass is a blessing. That's a great reminder. Regardless of which way you see life or events in life, it's good to remember that you have one at all! :) I love the sentiment of being glad to have a glass! Excellent....be glad to have a glass! Indeed!